With a world of flowers from which to choose, finding the perfect ones for your landscape or home may seem overwhelming. There are many plants that have heart-shaped leaves, such as hostas, caladium and lilacs, but only a few with heart-shaped flowers. If you want to grow special eye-catching flowers which will be the topic of conversation among your neighbors and guests, then select plants with heart-shaped flowers. Bleeding hearts, also known as dicentra, adorns the garden every spring with 3/4 inch white or pink heart-shaped, dangling blooms. Flowers grow in rows in groups of seven to 15 along a curved leaf stem. 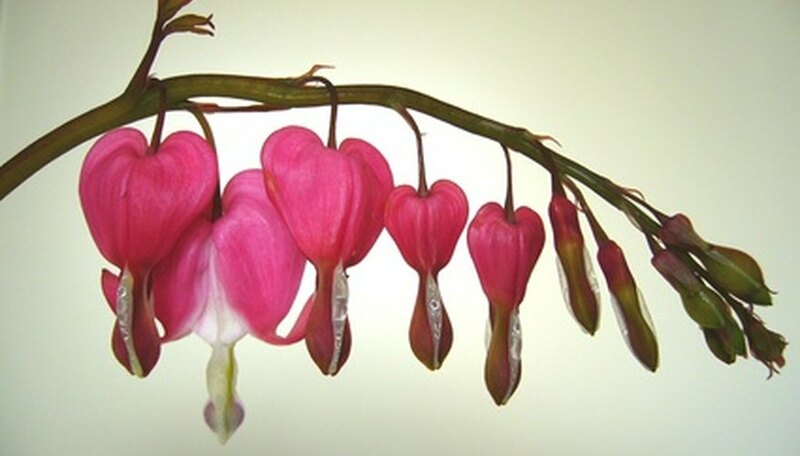 As the blooms open, tear-shaped structures appear which make it look like the hearts are bleeding. These tear-shaped structures are rather where the pistols or stamens are located. Bleeding hearts are shade tolerant and are winter hardy in USDA plant hardiness zones 2 to 9. There are many anthurium varieties, and they are very different from one another. Many anthurium cultivars have both heart-shaped blooms, usually red or pink in color, and heart-shaped leaves. They include, but are not limited to the Tropic Fire, Orange Hot, Small Talk, Salsa, Purple Plum and Pink Frost varieties. Anthuriums can grow indoors as houseplants or outdoors in USDA zones 10 and 11. Macartney Rose (Rosa bracteata) is a thorny, evergreen shrub with flowers that are composed of five white heart-shaped petals surrounding a yellow center. It is highly fragrant and typically planted in USDA plant hardiness zones 6 to 9. It grows well in clay soils. It is considered to be invasive, spreading quickly and forming thick clumps about 10 feet wide and high. Yearly pruning will help keep the Macartney rose under control.